In other words, unripened almonds. I think you have to be born Turkish in order to like these! They are viewed here as an early harbinger of spring not necessarily a delicacy but even so, quite popular. 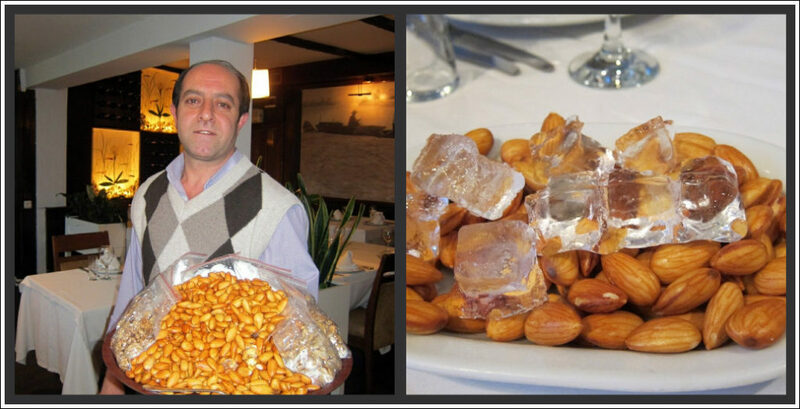 I find it hard to understand the attraction in the land of baklava and sweet syrupy desserts. I am almost late posting about these as spring is marching on and of course the almonds are getting riper by the day . But when you see these in the markets, you should be aware of what they are – and don’t buy them! This what they look like: pale green and furry. You bite into them and split the case with your teeth to find the kernel inside. At the market on Monday I had one just to have another try, but no, not for me. Most definitely not. The guys on the stall obviously thought I was mad as I spat it out! However in the restaurants it’s another story. 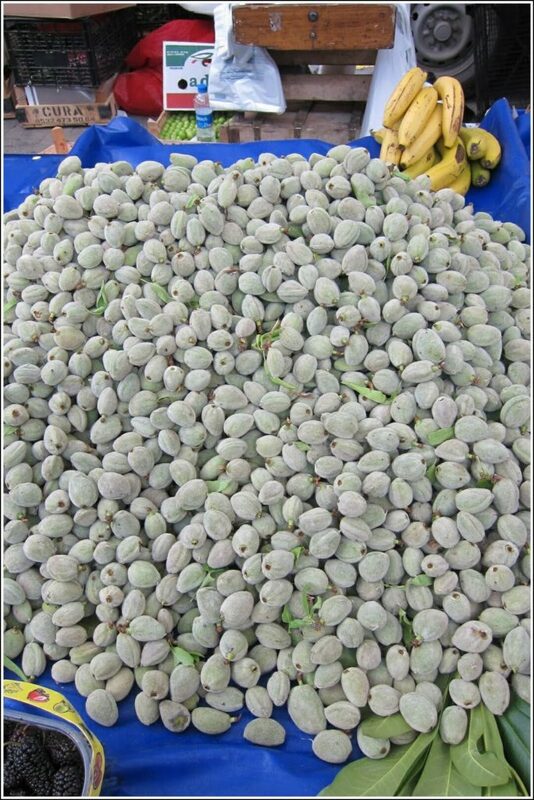 Don’t be surprised if suddenly a vendor from the street appears at your table bearing a tray like this laden with peeled almonds. This seems to be perfectly acceptable to the establishment and if you so desire, you order a plateful like the one above. It’s a sublime combination of freshness and texture. And only available now! Hi Claudia! I would love to repost this on my blog (wordpress). May I have your permission? Of course I will link it back to you. That would be absolutely fine by me, Terry! Thanks! BTW love your blog's new look! What do YOU think of çağla? Thanks! I think people back home are interested in learning about different Turkish culinary delights. I personally, don't care for çağla. But it is interesting! and.. Erik! Why do people like unripened fruit?! It's crazy. One time when I lived on the bottom floor of an apartment building, every spring about this time of year, I'd have children climbing the plum tree in order to steal the unripened plums. I asked them, with a smile (because as long as you smile you can say almost anything in Turkey) "Are you monkeys?" When I thought I'd seen everything, a couple of days later, I saw a pair of scarfed middle aged women climbing up that same tree!! Glad you liked it! It is interesting, isnt it? Nomad, I really don't get it though. yes, they really love them!!! Froggie, you wldn't like these, I promise! Delighted to have discovered your wonderful blog Claudia. So pleased to see you bringing the rich history – gastronomic and otherwise – to a wider international audience. I was trying to explain the pleasures of eating unripened almonds to friends in the UK just the other day. Great to find this post! Keep up the good work – looking forward to more recipes and fascinating insights.